When device drivers are not available (yet) for Windows 10, you can often install drivers that are meant for Windows 8, or even Windows 7. In most cases that works without any problems, but in some cases you need to run the driver installer in compatibility mode. This can be achieved by right-clicking the installer. But when the driver does not install even when running the driver installer in compatibility mode, you might need to disable the driver signature enforcement. Basically the driver signature ensures that the device driver is original and reliable, since it is guaranteed to originate from the manufacturer that put the signature on it. But in some cases a signed driver is not available, or even the signed driver fails to install on Windows 10. Move your cursor to the right top of the screen to bring up the menu bar. Click the Settings option in the bottom. In the Settings panel that comes up on the right-hand side, click the option Change PC Settings in the bottom. In the PC settings panel that comes up on the left-hand side of the screen, select Update and recovery, again in the bottom. The Update and recovery screen comes up, and now you need to click Restart now under Advanced startup. Once the PC has restarted, you will see a screen that says Choose an option. Here you click the Troubleshoot option. Under Troubleshoot you select Advanced options. Next, click Startup Settings, and then Restart. After restarting a list with Startup Settings comes up. In the list you select option 7 to disable driver signature enforcement. You can either press the 7-key or use the function key F7 for this. Your PC will again need to restart, after which you can install the driver. When installing the drivers, make sure to continue with the installation, even if Windows shows a warning regarding the unsigned drivers. Using the Device Manager, you can easily check the details for each device on a Windows computer. But If you want a list of all drivers used by the system, the Device Manager is not suited for that. In Windows Vista, 7 and 8, however, you can create list of all drivers by using a simple internal command. To do this, first start a command prompt with administrator rights (right-click the command prompt icon and select Run as administrator in the popup menu). This will instruct the command to list all drivers, and use the SCV output format. The > -symbol isused to redirect the output to the file specified. 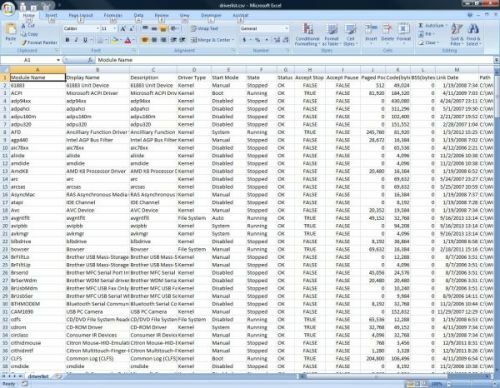 Now you can open the driverlist.csv file with Excel (or any other program supporting comma-separated-values), and check the details of the drivers in one overview. Like any computer device, printers need additional software to function in Windows. For hardware devices, this software is generally called a driver. By default, Windows supports a lot of devices since many drivers are already included in Windows, but many devices still need a separate driver or additional software to operate; for Hewlett-Packard printers, this is also true. HP printer driver packages include a lot of additional software, and not only the actual driver. This enables printer troubleshooting and offers additional printing functionality that is beyond the default Windows functions. As a result, the installation of HP printer driver software is a little more extensive and complex than other average drivers. Some HP printer driver installation packages are in the hundreds of megabytes! The problem we are addressing here is when the installation of an HP printer driver fails, resulting in error messages like “driver fatal install”, or “fatal error during installation”. Further error details can contain file names, error codes, or version mismatches. In most cases, driver installation errors can be solved by simply reinstalling the software again, sometimes a reboot is required before attempting the installation again. In these cases, the next step is to first uninstall the previous installation, so that a clean system can be used to reinstall the HP driver software. The simplest way to do that is to uninstall the HP printer software from the Control Panel -> Uninstall (or Add/Remove programs) option. If, however, the HP printer software installation failed in an early stage, the software might not show up in the Control Panel uninstall list. That means the removal of the failed software will not be possible that way. The next thing to try in that case is to use a cleanup utility to fix the corrupted registry. Microsoft used to have the Windows Installer Cleanup Utility for this purpose, but due to conflicts with Office 2007, it was replaced by the Microsoft Fix It solution. The Fix It solution will clear bad registry keys that can prevent programs from being installed. Keep in mind that it does not actually remove any files from the failed HP driver installation. Those will simply be overwritten by the next installation. Instead of the Microsoft solution you can also try using a program to scan and fix the complete Windows registry, which does not limit itself to installer issues only. You can use such a program to clean all HP entries from your system before attempting the reinstall. If you are running XP or Vista, it is also possible that that the Windows Installer itself is corrupted. In that case you can simply try to download the Windows installer and reinstall that. – Open a command prompt with administrator rights. – Type: msiexec /unregister and press Enter. – After the command completes type: msiexec /register and press Enter again. For HP Officejet printers, HP offers a driver removal utility that can help you remove the HP printer driver for specific models. If the previous steps did not help, and you are using an Officejet, you can download and run this utility. Please check the details, as the utility is limited to specific driver versions. – Run a disk cleanup to clear out the temp folders, which are used for temporary installation files. – Stop the HP services using the Manage Computer option to prevent DLL files being locked. After the install cleanup is finished and the Windows installer is fixed, you need to reinstall the HP Printer driver software. Unplug the HP Printer and reboot before you do this so that Windows does not install any default drivers for the HP device. During installation you can reconnect the printer when the installation process indicates that. Please consider that even for wireless printers you sometimes need to make a physical connection with the PC during the initial installation. Please check the printer manual for details. If installation still fails, and you are using a USB connection, try using a different USB port, and make sure not to use an external USB hub between the PC and the HP printer. Lastly, always make sure to use the latest HP driver software, to guarantee that you are not suffering from old versions with possible bugs or limited functionality. 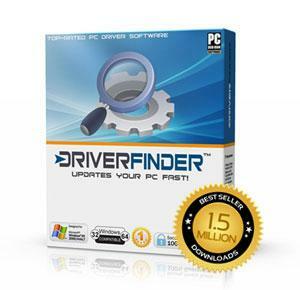 To scan your PC for all drivers and find HP updates, use DriverFinder! Make sure the iPad, iPhone or iPod is connected to the PC using a USB cable. Open the Windows Device Manager from the Control Panel, or type “devmgmt.msc” at the Start menu. 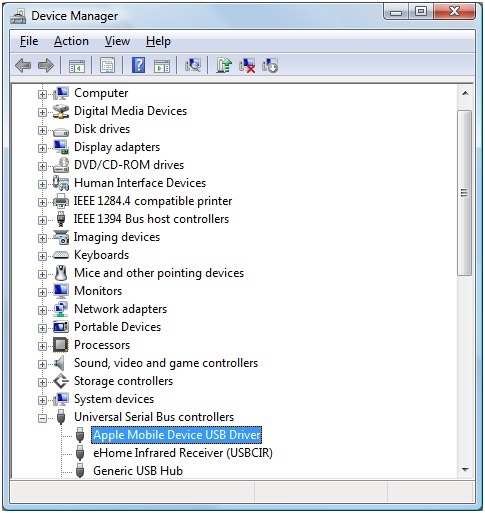 In the Device Manager, expand or open the Universal Serial Bus Controllers group. Locate the Apple Mobile Device USB Driver, and right-click this device. In the popup menu, select Properties. Next select the Driver tab. 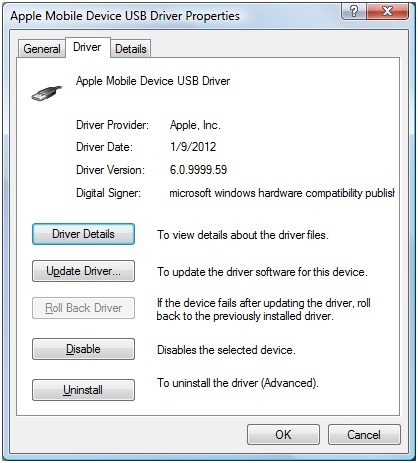 Check the Driver Date and Driver Version of the Apple USB driver to see if you have the latest version of the driver. To update an Apple USB driver, you normally need to install the updated iTunes application. If you download the stand alone Apple USB driver update using DriverFinder, you can simply update the driver without the need to download and install the complete iTunes software. Once downloaded, simply run the AppleMobileDeviceSupport.msi (or AppleMobileDeviceSupport64.msi for 64-bit Windows versions) to install the new driver. When you plug your iPod, iPhone or iPad, the new driver will automatically be used! Your PC is made up of many devices that interact with each other. Although in most cases updating your drivers is the solution to CD/DVD problems, there may be PC settings (or other applications) interfering with your CD/DVD device. The following steps outline what you need to do to delete filters in your Windows registry, which may be preventing you from using your CD/DVD device. Steps may vary slightly depending on the Windows OS you use. ALWAYS back up your Windows Registry before making any changes. Type regedit in the space provided and then click OK.
On the right pane, click UpperFilters. Note: You may also see an UpperFilters.bak registry entry. You do not have to remove that entry. Click UpperFilters only. If you do not see the UpperFilters registry entry, you still might have to remove the LowerFilters registry entry. To do this, go to Step 7 below. On the right pane, click LowerFilters. If asked to confirm the deletion, click Yes.